Light Lemon Sponge filled with Lemon Curd, and topped with a deliciously sweet Meringue! 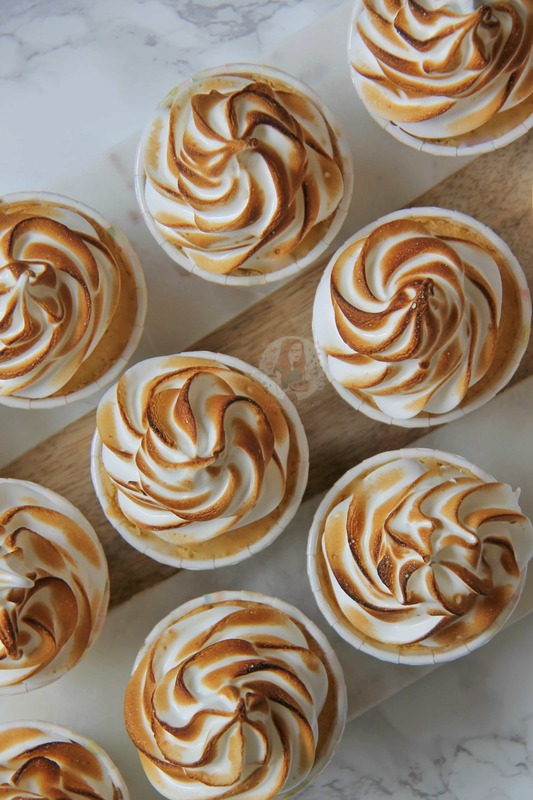 I have always had a thing for meringue, I realise it can be a bit of a ‘marmite’ situation where some utterly despise it, wheres others (including myself) LOVE them. I eat meringues at any occasion, especially in Eton Mess – so good. 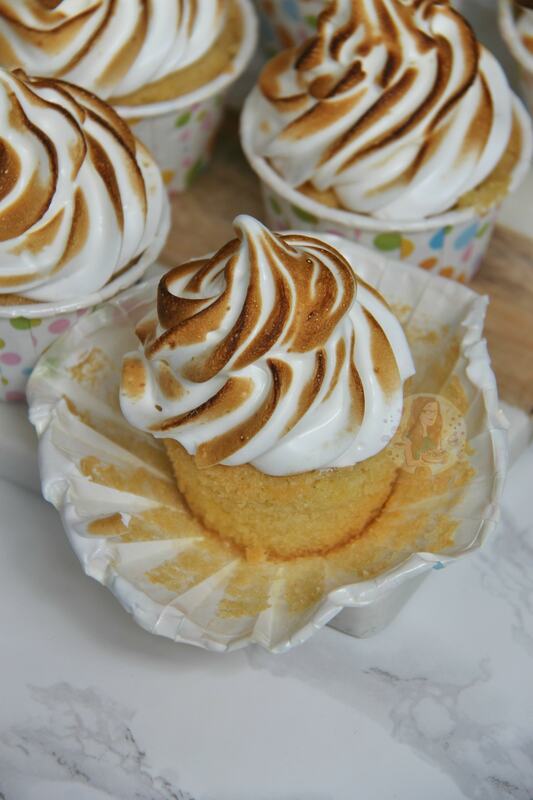 However, I realise I had never posted my recipe for my Lemon Meringue Cupcakes! These cupcakes have a delicious lemon sponge with lemon zest in, filled with a lemon curd (I use my homemade lemon curd!) and topped with a silky smooth and fluffy meringue topping. I love using my Andrew James Blowtorch to finish these off – even though I was terrified of using a blowtorch a couple of years ago for fear of having no eyebrows anymore! These cupcakes are SO good. I am not joking, they went down insanely well with my taste testers, and have been asked to make them already for two birthday parties! The meringue topping is so light in comparison to buttercream (not saying there is anything wrong with buttercream there!) but it makes a lovely change! I have tried doing a meringue style frosting, but I have always preferred the classic meringue, and I have even changed people who originally didn’t like meringue, to liking these as its so fluffy and moist! Even my boyfriend, who haaates lemon, is a fan of these. 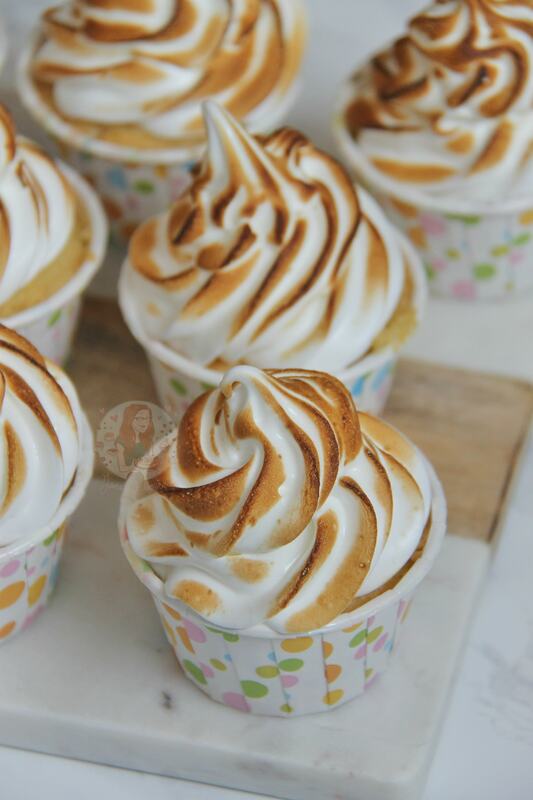 I make my cupcakes on the day that I need them, the meringue is always best on the day, but will last in the fridge overnight if need be – fresher the better! However, the actual cupcake recipe is utterly lemony and delicious and lasts for 3-4 days if you wanted them too! This recipe makes 12-14 cupcakes! 1) Preheat your oven to 180C/160C Fan, and line a 12-hole Muffin Tray with Cases, or put 12 Iced Jems Baking Cups on a tray. 2) Cream together the butter and sugar until light and fluffy, add the self raising flour, eggs, and lemon zest and mix until a cake batter is formed – it doesn’t take too long! Especially if using an electric mixer! 3) Spoon into the cupcake cases and bake in the oven for roughly 18-20 minutes until they are cooked through and turning slightly golden – leave to the side to cool. 4) Once they have cooled, cut out the centres of the cupcake to make a small hole and fill with a Lemony filling – I use either Lemon Curd, or the new Dr Oetker Zesty Lemon Filling! Leave to the side whilst you make the meringue. 5) To make the meringue, put your egg whites into a large bowl or electric mixer and whisk until stiff peaks are formed – this means when you stop whisking, but lift the mixture up, the peak formed by lifting up will not really move, it should hold itself! 6) Keep on whisking but this time add spoonfuls of caster sugar as you go – its important not too add too much at once otherwise the meringue will not work! I use a slightly heaped teaspoon each time I add sugar. Keep going till all the sugar is used up, and if you have done it correctly it will be glossy, light, and hold itself. 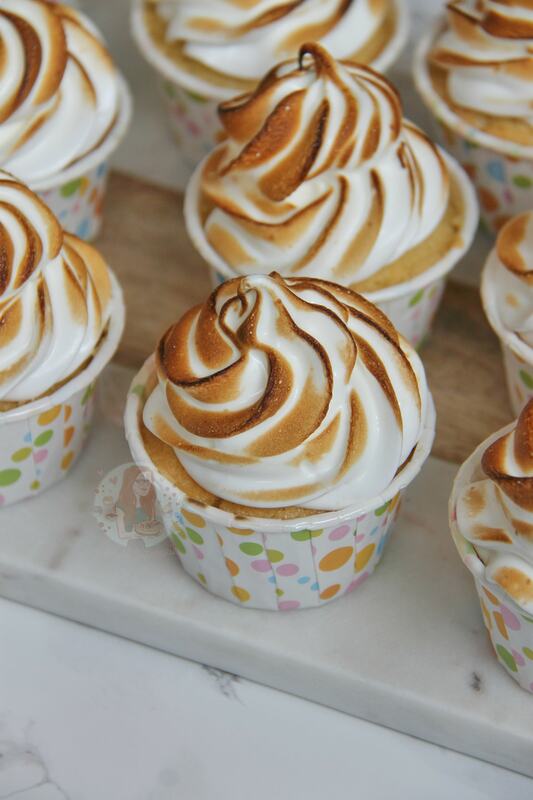 7) Pipe the meringue on top of the cupcakes with a 2D Closed Star Piping Tip and Blow Torch to colour – if you don’t have a Blow Torch you can put them back in the oven for 5 minutes or so to colour! I love Meringue but I realise using a blowtorch is a bit daunting! All I can say is have a light touch, don’t go too close otherwise it’ll burn VERY quickly, and don’t be afraid! Follow the safety instructions of your Kitchen Blowtorch and you’ll be fine! You can always try this with another citrus flavour, but lemon is definitely my favourite! With Meringues I usually keep to the idea of 1 medium egg white = 50g caster sugar so that if you wanted to make more or less meringue for the topping, simply take these away of add them on and it will still work! These will last for 2 days in the fridge with the meringue, 3 days without the meringue at room temperature. I buy my Cupcakes Cases/Baking Cups from Iced Jems – here! Older Next post: Oreo Cupcakes! Newer Previous post: No-Bake Toblerone Cheesecake! Hello, how would i cook the meringue without a blow torch? The meringue doesn’t have to be properly cooked, but you can brown it under a hot grill maybe?! Love this recipe, I would love to share it on our Instagram page. We only share recipes that require a culinary butane torch. Hiya! You can share the image if you like with a credit to myself? And I’m based in the UK so might be a little far away haha! Hi Jane, I made these for a friends birthday dinner. Omg they were amazing. Absolutely delicious. Thank you for sharing the recipe. Reblogged this on Confessions Of The Girls Next Door. Look so goooooood !!! And pretty sure taste great !!!! ten thumbs up!!! I didn’t even realise the cupcake cases were singed until you pointed it out – I was too busy admiring the meringue! ABSOLUTELY GORGEOUS pictures! those cupcakes looks phenomenal! completely professional! =] and i dont bake much but your blog makes me want to try out the recipe you’ve shared. thanks for sharing it! 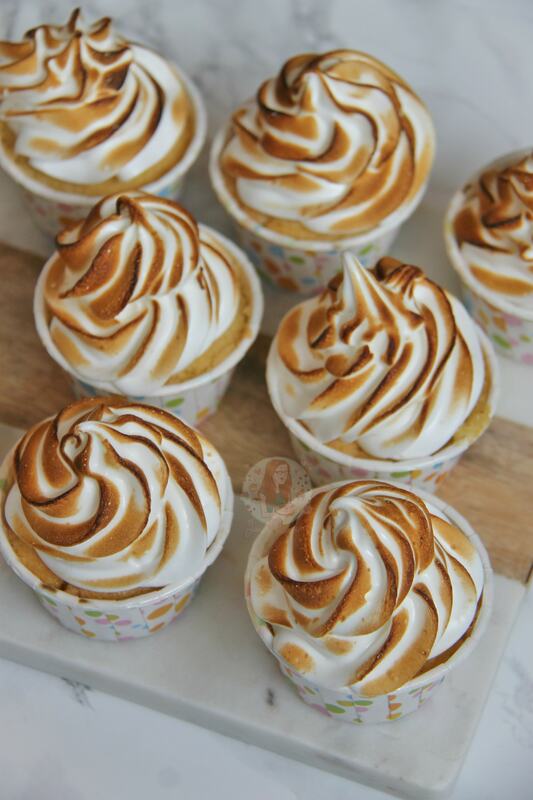 my husband LOVES lemon meringue pie but i like making these because you don’t have the pastry element.